A steel frame has given a local church and its parishioners the community facility they were praying for. Steel tonnage: 105tChurch and community groups in Stoke Gifford, Bristol will soon have a new Church and Community Centre, replete with a multi-purpose auditorium seating up to 550 people, seminar spaces and offices at their disposal. Adjacent to the village green, close to the parish church of St Michael’s and abutting the existing St Michael’s Old School Rooms (a new facility seating up to 200 people, with a coffee shop and meeting rooms), the new facility has been built on recently acquired land formerly occupied by derelict barns. This latest project enhances the aim of St Michael’s of serving the local community. The new building also seamlessly fits into its surroundings by incorporating two retained walls and using locally sourced blue lias stone cladding for the majority of the façades. The Centre is a mixture of two-storey and single-storey elements that wrap around an auditorium in a C-shaped three sided configuration. Two sides are two-storey and accommodate meeting rooms and offices, while the third single-storey side consists of a crèche, resource centre and storage room. 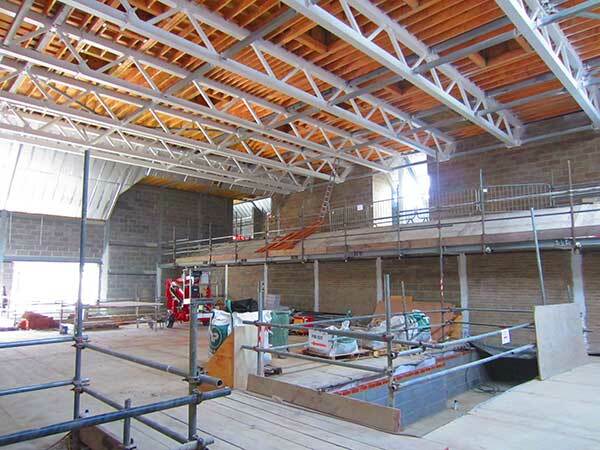 Once the preparatory programme had been completed the steelwork package was able to commence. 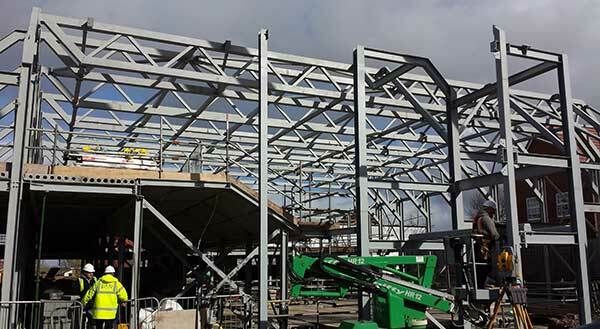 Structural steelwork has been used to form the building as this was seen as the most economical and cost effective solution. “We wanted a structural frame that was quick to construct and one which would easily incorporate the 21m-long spans we have in the auditorium. 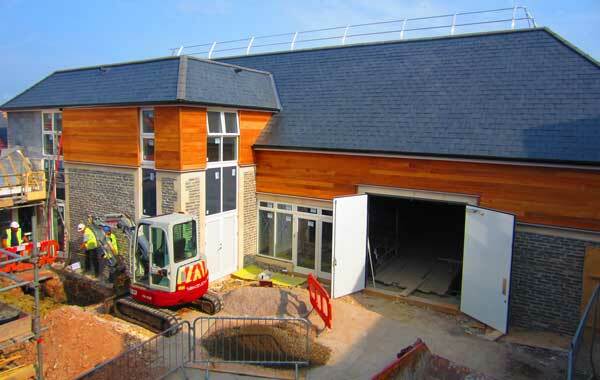 Steel was the obvious choice,” says Phil Winch, CPL’s Project Architect. The church says the building has to be flexible for use by a large multi-use church congregation. In the space provided by the large steel beams, services of worship and church community events can be greatly enhanced and young people will have a creative space to experiment with how their Christian faith can be worked out in the wider world. Steelwork abuts and goes over the single-storey high retained walls, meaning they are incorporated into the new structure but structurally independent. The majority of the steel frame is braced for stability, with the exception of the single-storey element which is rigid frame gaining all of its stability from the connections. Elsewhere in one of the seminar rooms some Macalloy bracing has been added to three bays. This is an architectural feature, as it will be left exposed within the completed building, as opposed to the rest of the structure’s bracing which is hidden in wall cavities. Collaboration was a key element for the design of the structure. Using the architect’s initial drawings and the engineer’s structural design, steelwork contractor MJ Patch created its own 3D model in order to design the steel frame’s connections. This helped with the design process and meant that MJ Patch was able to begin the steel erection programme on time. One 100t capacity mobile crane was used to erect the entire steel package with the auditorium being the final part to be constructed. “As the auditorium forms the central core of the building it would have been good to erect it first but site logistics dictated otherwise,” explains MJ Patch Project Draughtsman, Phil Brunskill. With the crane positioned in the middle of the site on the auditorium’s footprint, the C-shaped part of the Centre was erected first in a phased programme that also allowed the floor slabs to be installed. “Once this part of the steel was up we had to move our site cabins to create enough space for the crane to be repositioned. This then allowed the auditorium to be erected,” adds Mr Smith. 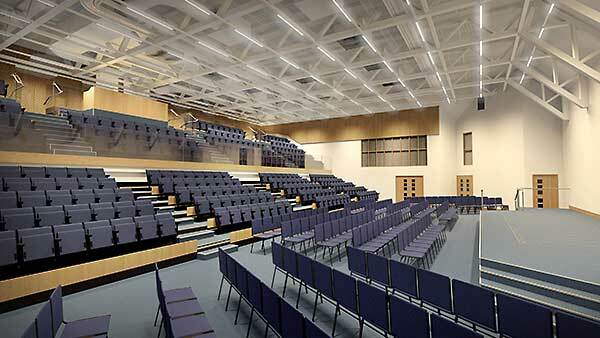 Forming the double height space of the auditorium is a series of 21m-long SHS trusses. The sections were chosen because they can incorporate services within their depth and offered the client a cost saving on more traditional cellular beams. Using SHS sections was also a lighter option, which meant it was the economical way to go as far as the design team was concerned, as there was less deflection with these members. The trusses were fabricated and delivered to site in two sections, 14m and 7m long respectively. These were bolted together on site and then lifted into place as one section. Completing the architectural design of the auditorium, the shorter 7m lengths have a fabricated crank that forms a chamfer in the roof’s edge. The trusses are set at 2.8m spacings and this grid then forms the pattern for the majority of the surrounding ground floor areas of the building. The St Michael’s Church and Community Centre shell is complete and Bray & Slaughter is now involved in the building’s fit-out which is expected to be finished in April.